Chicago Newspaper Guild Executive Director Craig Rosenbaum leaflets at the Halloween ball. It was meant to celebrate the scariest night of the year, but guests at the grand gala Saturday night at the Chicago Cultural Center had little to fear. Party planners went out of their way to protect them from the night’s major menace: Guild members past and present, armed only with the truth. The occasion was the inaugural Sun-Times Foundation Halloween Ball. For $1,500 a ticket, the city’s elite got to hang out with their kind, have their fortunes told and nibble Vosges Haut chocolates. Wrapports Chairman Michael Ferro refused to accept a flyer. CEO Tim Knight pocketed his for future enjoyment but his wife returned her leaflet, saying she couldn’t accept union materials. Cubs chairman Tom Ricketts started reading right away, and another copy got an immediate perusal by a gorgeous blonde we’re pretty sure was Splash columnist Jenny McCarthy. 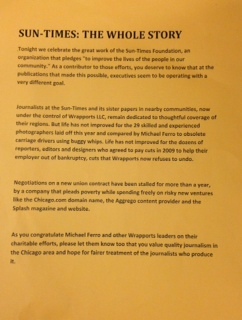 The flyer text was straightforward, supportive of the work of the Sun-Times Foundation but explicit in describing Wrapports’ treatment of workers and stalling in negotiations. Halloween Ball guests apparently could not be trusted with this information, and party planners went to work to keep the facts out of their hands. First a security guard ordered the leaflet boogeymen to leave, and was rebuffed. Then a Wrapports employee was stationed at the Cultural Center entrance to confiscate flyers from the entering guests. Undeterred, the Guild will continue bringing information to concerned Chicagoans, both at Wrapports-affiliated society events and at businesses that advertise in Sun-Times Media publications. Only a fair contract will bring these member mobilization efforts to an end. What a bunch of aholes milking the suntimes media down to nothing for their own benifit at the expense of the workers.